Now, you’ve probably heard a bunch of crazy tips to help put an end to the sob story of cutting onions. To be honest, most of them don’t work. Never fear! 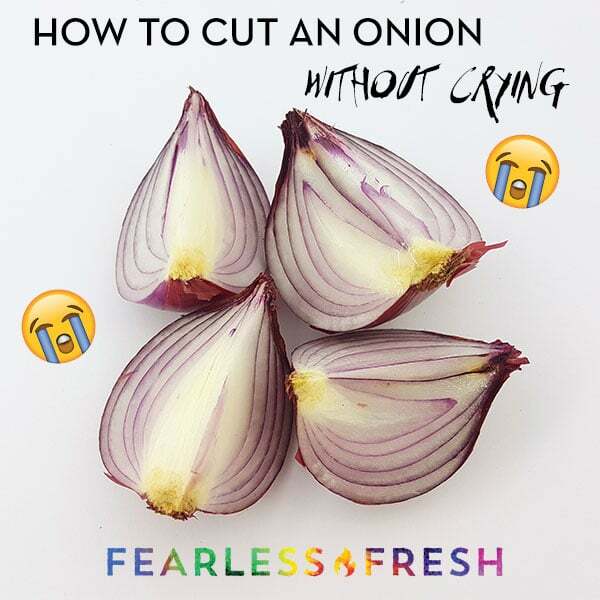 I’m going to share 5 real tips that’ll keep the waterworks under control next time you slice an onion. And not all of them involve suddenly turning you into a knife skills ninja. Before I get into my tips for how to cut onions without crying, let’s take a quick look at why onions make us cry in the first place. Whenever you cut, chop, slice, or dice an onion, you essentially break down the cells of the vegetable. As a result, a handful of chemicals from within the onion’s cells combine to create propanethial S-oxide. Once this stuff works its way into the air and hits the sensory nerves in your eyes, boom; the waterworks come on. This is arguably one of the most practical ways to keep from crying when cutting onions. The science behind this trick is simple: by cutting your onions under a fan, you help disperse the tear gas from the onion in the air and it gets sucked up by the fan, keeping it away from your eyes. This is BY FAR the most effective trick I’ve found to cut onions without crying. Before you cook, throw your onions in the fridge or freezer to chill them. By chilling the onions first, you slow down the chemical reaction that takes place when you cut them. This will help slow the release of propanethial S-oxide into the air when you’re cooking, leaving you with fewer tears. To chill your onions, put them in the fridge for roughly 30 minutes to 1 hour before you plan to use them. Alternatively, if you’re pressed for time, try putting them in the freezer for about 20-30 minutes. Most importantly, don’t let your onions freeze. Once they’re frozen, onions become literally impossible to cut. And, by the time they’ve thawed they’ll turn into a soggy, tasteless mess. 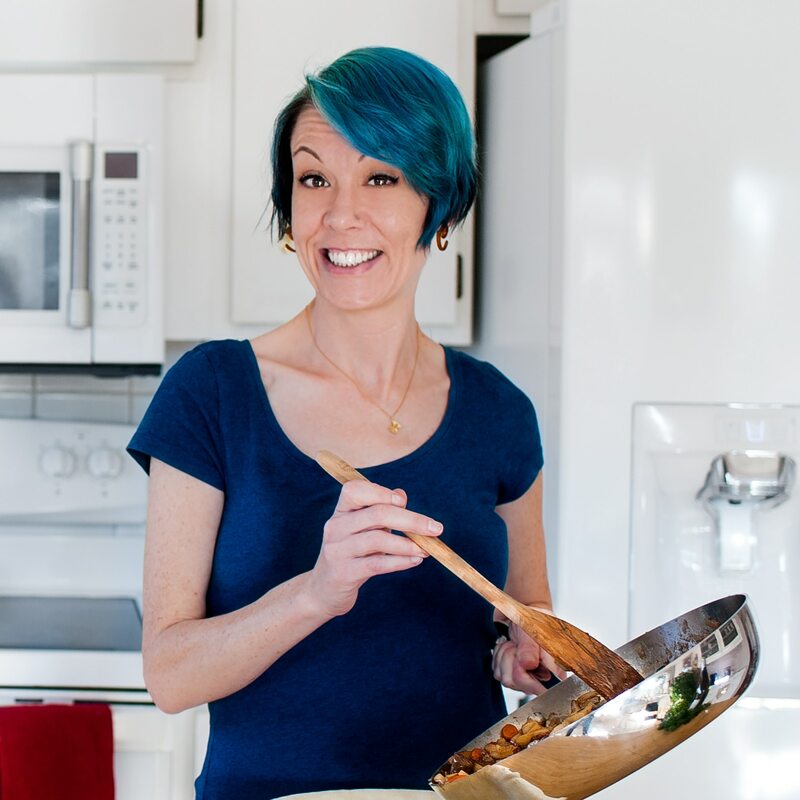 Note: Also, don’t store your onions in the fridge long-term as they will go soggy, lose their flavor, and contaminate the flavor of other foods nearby. (No one likes onion-flavored milk in their coffee. 🤢) Instead, keep them in the pantry and chill them about 30 minutes before you start cooking. Ever cut an onion that seems to make you tear up more than usual? Chances are you were using an older onion. Old onions are particularly hard on the eyes. It could be that older onions contain more sulfur and hence produce more propanethial S-oxide when you cut them, but the science isn’t 100% clear on that. Regardless, steer away from old onions if you want to avoid waterworks in the kitchen. Instead, use fresh onions as soon as possible. The trick is to buy smaller quantities of onions, to make sure they’re not just hanging around your kitchen. If you like buying onions in bulk, maybe opt for a few onion-rich meals throughout the week. Just make sure to reschedule any dates or dentist appointments you may have made. Sharp knives are the backbone of any decent kitchen, but did you know that using a sharp knife to chop an onion can help keep you from crying? Blunt knives make chopping, dicing, and slicing extremely difficult, and tear the onion’s cells as you cut into it. In doing so, you end up releasing more propanethial S-oxide into the air, which ultimately leads to more tears. Goggles form a protective layer around your eyes and help block out any propanethial S-oxide in the air around you. You might get weird looks from everyone who sees you in the kitchen, but that’s a small price to pay for tearless onion cutting, right?